The work on the garage roof and repair of the north retaining wall are done, thus we moved the two hives back. Moving hives is a messy matter and I don't advise it, unless there is no other choice. The bees take a huge hit, resulting in large losses of forage bees and massive hit to the hive as a whole. I'm super happy that they are back in place and can resume their bee-siness without further interruptions. Just before moving them I did an inspection of the top two boxes on each hive. Both hives had sealed up all the spaces between the boxes, thus removing one box off the other was quite a challenge. During the work on the house our hive tool disappeared, thus I had to use a painting spatula instead, which didn't work so well. The gals make a paste from tree resin which is called propolis. This paste acts as a sealant to prevent unwanted guests, reduce vibration and increase the stability of the hive body. I normally slide my hive tool, or in this case the spatula, between the boxes on all four sides to "un-glue" them. Sometimes however, if we haven't done an inspection in a long time, the girls will adhere the interior frames to the hive top. Sigh, this is when things get messy. Such was the case and why I was particularly disappointed I didn't have the trusty hive tool. In either case, I scraped off quite a bit of propolis and have that now "alchemizing" in some organic grain alcohol for future use. The smell is a combination of resin, wood and honey with a strong spice note. The aroma has similar notes to the perfume To Bee. The Warrior Girls, who arent' quite so fierce anymore, had empty frames in both top boxes. This was very odd and warrant a much bigger inspection in about a month once they have settled in. The other hive, with the Mische Girls, was a completely different scenario, although these gals were not as established as the Warrior Girls they have been jamming and have a top box of honey frames. Weeee! We saw no brood in that box what-so-ever and thus for the moment are suspecting that this box is their honey stores. Since we didn't do a full on inspection and thus do not know exactly how much honey they have stored up, we only stole one frame from them. 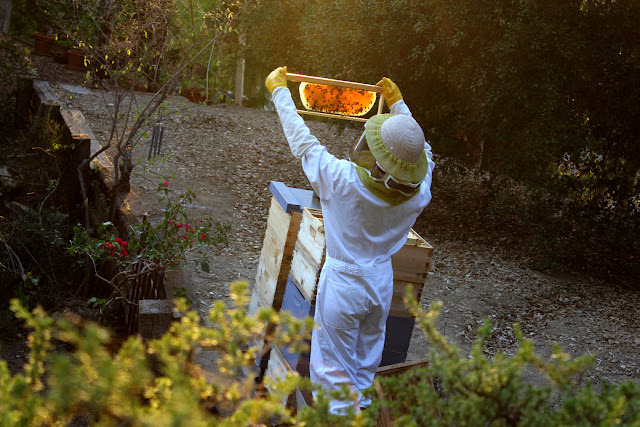 This is the derth part of the year for them, thus we mustn't take too much honey or they will not have enough to sustain the hive until January when Spring arrives here in LA. 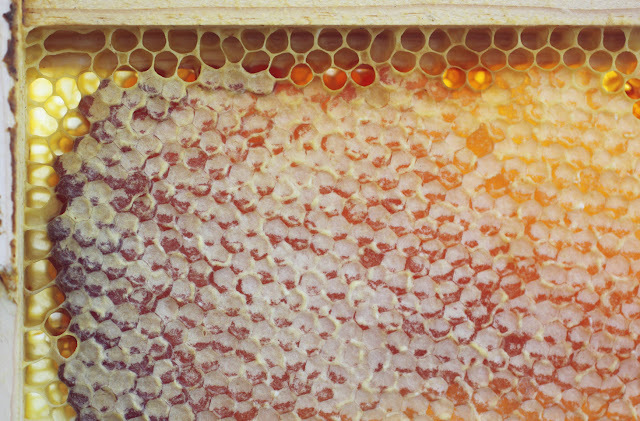 When the bees gather nectar from the plants they store it in the cells of the honey comb, when it is ready the seal the cell of honey with a layer of wax. Thus each cell in a honey comb serves as a jar with a cap. After crushing and filtering that one frame we ended up with a 1 gallon of our very own chaparral woodland honey. This was a first for us and we are pretty thrilled. 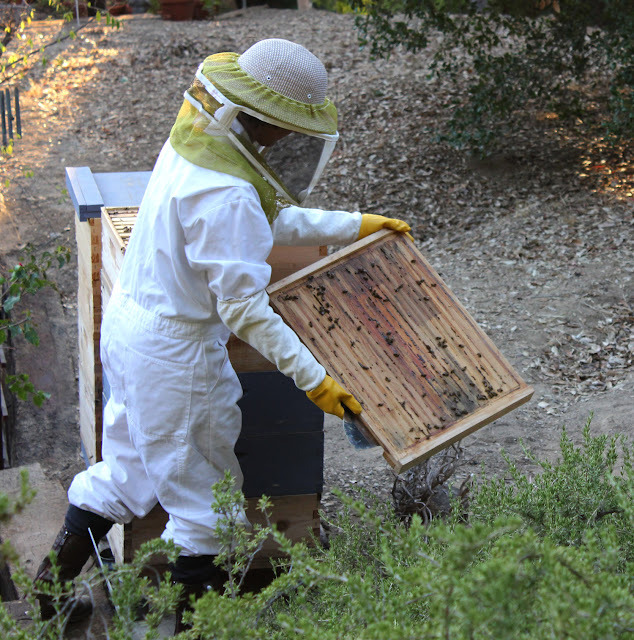 Greg took the photos of me in the bee suit, these are of the hives back in their original location. Notice the California oaks to the right of me, those are the ones we saved which inspired the fragrance Q. Photo of honey comb and honey jar ©Roxana Villa, ask before using, thank you. That's wonderful, Roxana! That first picture of you is great with the honeycomb glowing in the light as you hold it up. 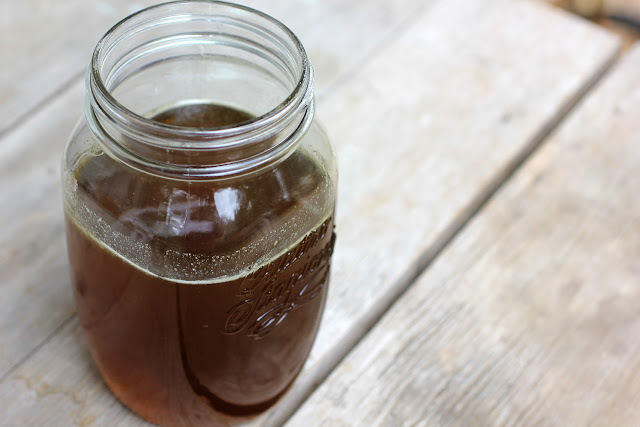 The honey is beautiful and looks so delicious!! Caile, the girls are amazing creatures. I am totally in love with them and everything they create. Karin, I use beeswax absolute from France and agree, it is absolutely mouth watering!! Wish it weren't so darn expensive.